If there’s one country that’s completely blown us over with its diversity and quality of experiences, it is Italy. Nowhere else have we seen a passion for local food and culture so deep and no other country we have visited has taught us as much about art and history like Italy has! Italy is fun, chaotic, exciting and of course, gorgeous! 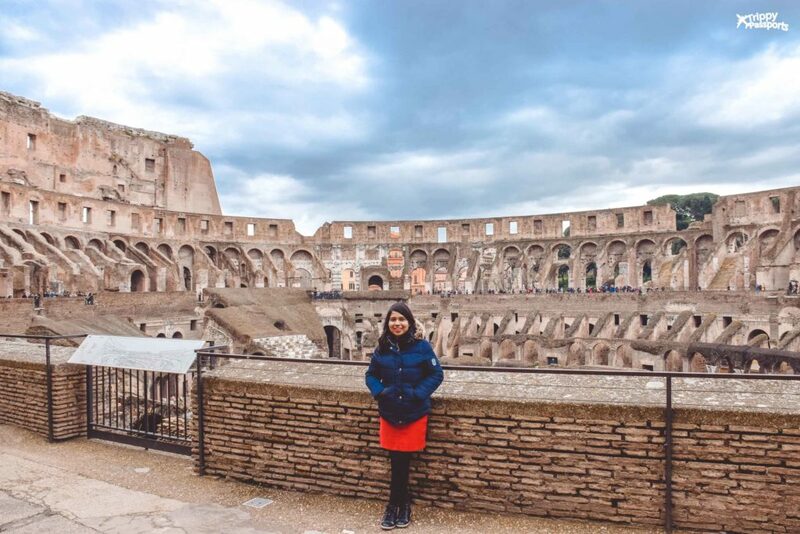 Our 12-day Italy itinerary was the perfect introduction to this vibrant country that gave us a chance to explore some of its most famous cities. As first-time visitors, we were keen to see as much as we could in that time. But it’s important to remember that, although 12 days in Italy may sound like a lot of time, it is just enough to visit about 3-4 major cities at a comfortable pace, whether you are travelling solo, as a couple or with family. Our favourite time to visit Italy is from November to March when the weather is on the cooler end of the spectrum and the crowds are lesser than what you would see in summer. We visited Italy in early February and although the weather was quite cold, the days were perfectly sunny and most importantly, there were barely any queues outside the main tourist attractions! We know how overwhelming it can be to plan a trip to a country like Italy where you have to pick and choose only a few cities to explore. From the awe-inspiring Dolomites in the north to the sunny beaches of Sicily in the South, there is no dearth of places to visit in Italy! But let’s be realistic – we all have time and budget constraints. So for those of you who don’t have too much time in hand but still want to pack in a solid amount of experience, this Italy itinerary 12 days is a great place to start. Having said that, do keep in mind that the number of days spent in each city in this itinerary can easily be adjusted to suit your need. For example, you could also turn this into a 10-day Italy itinerary or even extend it up to 2 weeks depending on how much time you have. But from our personal experience, 12 days were perfect to cover the cities we will be talking about soon. Italy is a riot for the senses in every good way you can imagine! Add to that, train travel in Italy, and you know you are in for an unforgettable experience. Exploring Italy on trains can feel chaotic at times, but there is a method to all the madness. With a little bit of planning and preparation, it is very easy to travel through Italy on trains and navigate the country’s extensive rail network. And in our experience, this is truly one of the best ways to see Italy in 12 days, for the sake of convenience as well as a well-rounded experience. 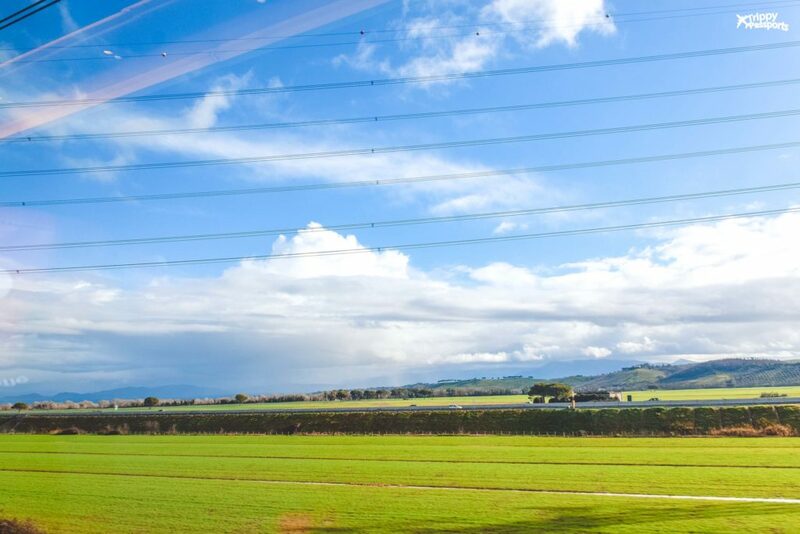 Trains operate more or less on time, the high-speed trains run really fast, seats are very comfortable across all classes and most importantly, travelling by train allows you to enjoy the Italian countryside in a leisurely manner! 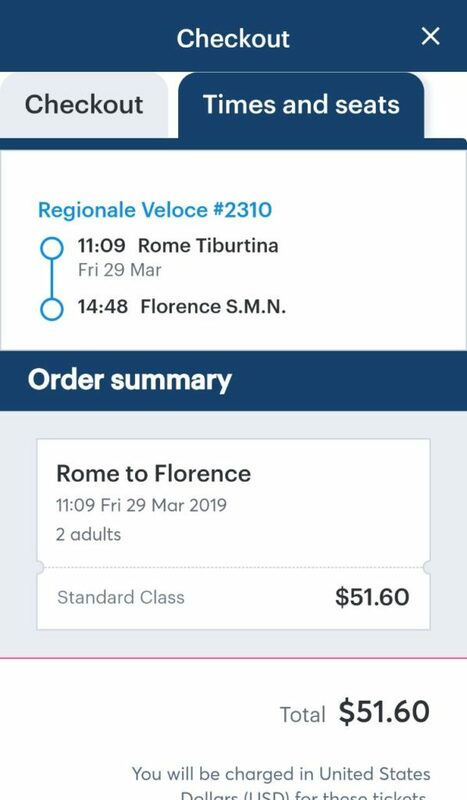 All our Italy train tickets were booked via a ticketing platform called Loco2, which is essentially an aggregator that allows you to search for and book train tickets across Europe all in one place. 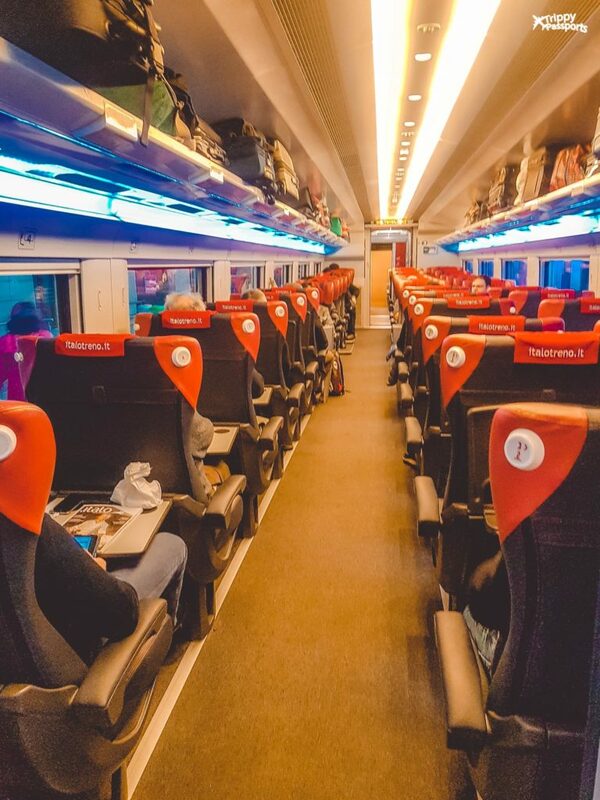 Before we go into the details of how you can spend 12 days in Italy, here’s a little more about our train booking experience on Loco2, which was truly a game-changer for us! 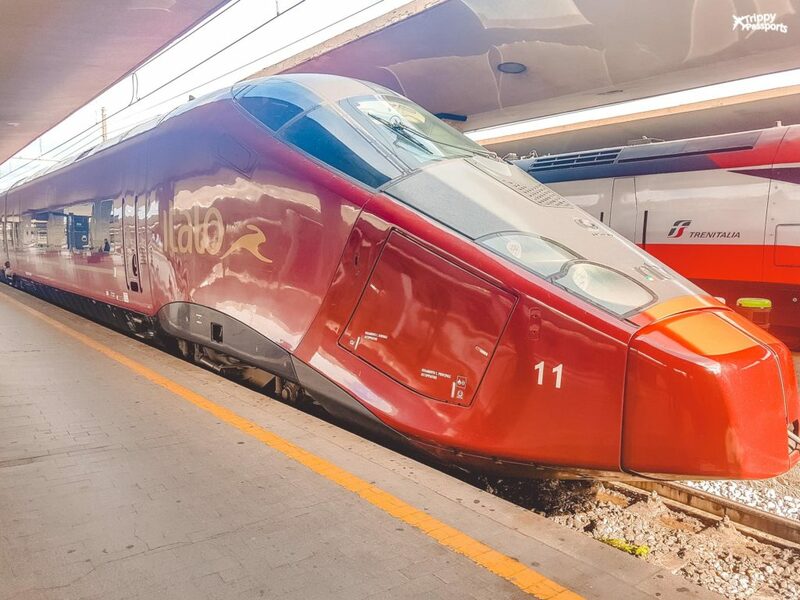 Italy is extremely well-connected via high-speed trains run by public and private operators so it makes complete sense to capitalize on it to see the beautiful country at your own pace. 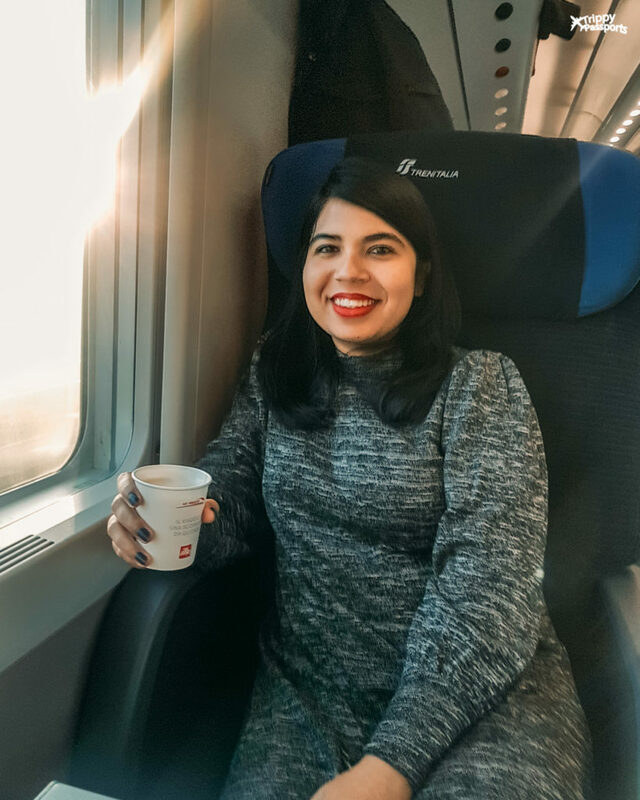 This Italy travel itinerary is entirely based on train travel between the different destinations we explored during our trip because we absolutely loved the experience and want you to have the same! 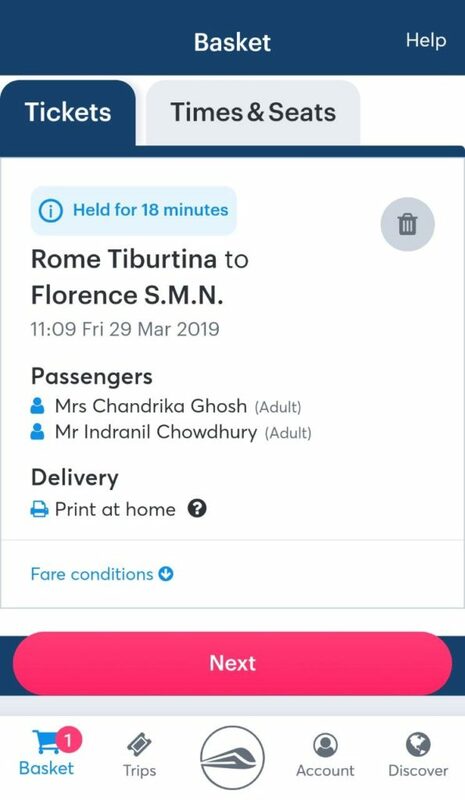 In addition to helping you plan an itinerary for your first Italy trip, in this section we will also share how we went about planning and booking our train journeys with Loco2. Convenience – This is probably the biggest reason to give Loco2 a try! Imagine the convenience that comes with a few quick clicks and taps and having your train travel itinerary ready to go on your phone. That’s exactly how simple the booking process is whether you use their website or the app. We didn’t even need to use the website honestly and did our entire trip planning and booking on the app itself without any hassle! 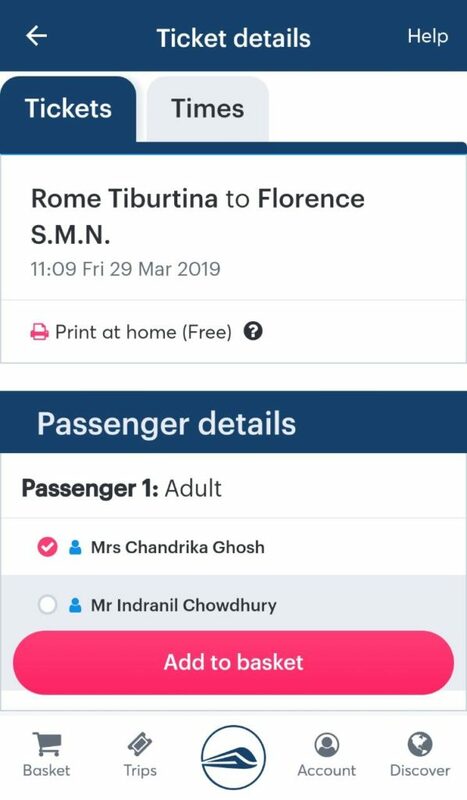 Whether you just want to search for different routes and plan a unique, customised itinerary, or you have it all ready and directly want to book the tickets, Loco2 is perfect either way. Self-design your itinerary – Loco2 gives you the freedom to build your travel itinerary any which way you want! Whether you want to start your trip in Rome and end in Milan or start in Venice and end down south in Sicily, the choice is entirely yours. You have complete flexibility to explore various route options and create an itinerary that works best for you! As long as there’s a train running between your chosen cities, go wild with your imagination and start planning your trip! Easy to use interface – A sleek, clean and simple user interface makes a huge difference especially when it comes to travel bookings. Imagine how hard it would it be to find and book flights if Skyscanner had a clunky, difficult to use interface? Loco2 has done a brilliant job of keeping things simple and straightforward, both on its website and app. It literally takes 6 simple steps to book a train ticket, as you can see here. Doesn’t get any better than this, does it? 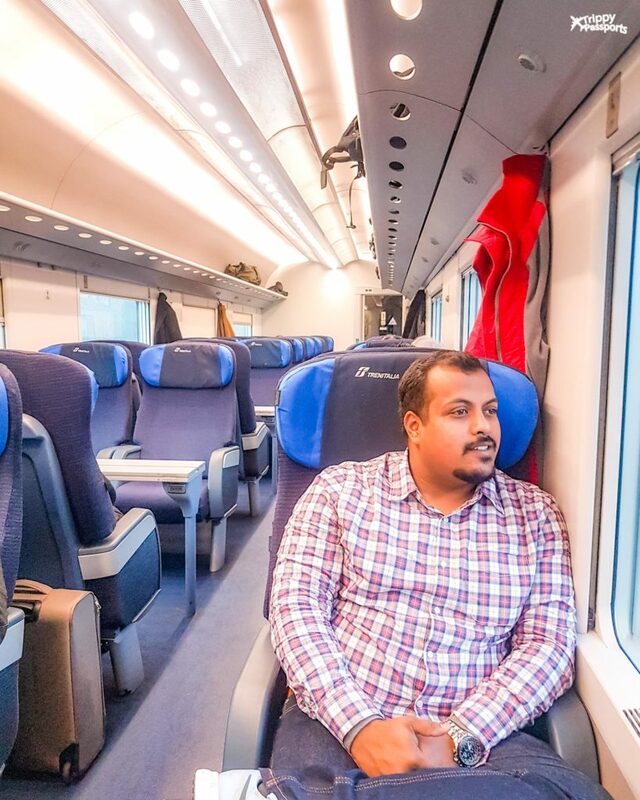 Paperless travel – Believe it or not, our entire train journey through Italy was paperless. 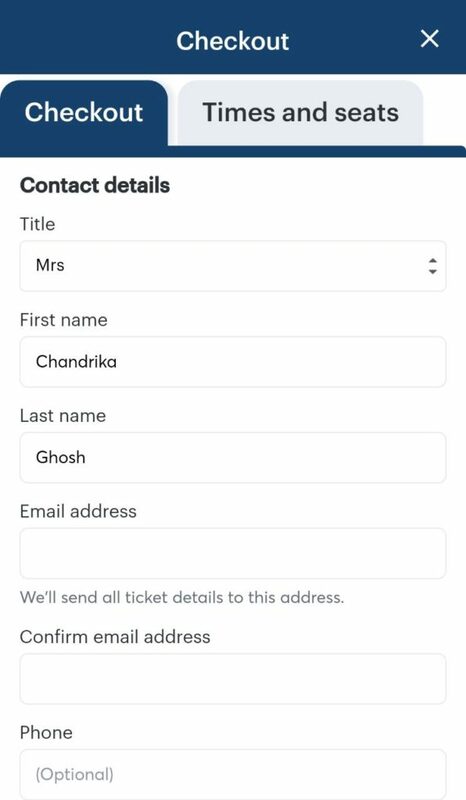 Every time we boarded a train, all we had to do was show our booking reference number from the Loco2 app to the ticket checker on the train and that’s about it. However, we would suggest, depending on which European country you are travelling in, confirm this with Loco2 after booking your tickets or with the railway authorities at the train station prior to boarding. This was an absolute breeze when it came to train travel in Italy! Explore multiple options in one place – Every country has its own train operators – public and private, local and national. So was the case with Italy. As a tourist, it’s hard to know which trains operate where or which one’s more value for money with respect to the travel time. How do you even know what are the options you have? This is where a portal like Loco2 comes in handy. All you need to do is search for trains running between any 2 cities on a particular date and Loco2 aggregates all your options in one place. No need to hop different rail operator websites in search of trains and then comparing them to pick the right one. You can now have all your choices in one place, compare prices, train amenities and travel time to make an informed decision. 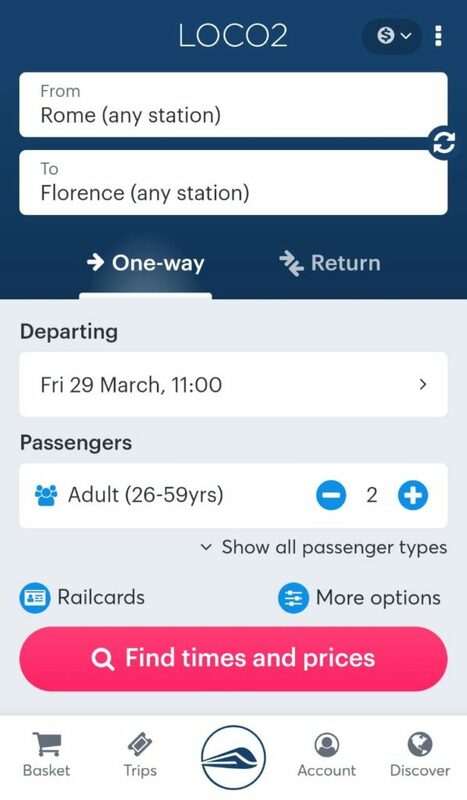 Ease of planning a trip from any location – Loco2 allows you to plan your Europe train travel itinerary and book tickets from the comfort of your home or wherever you are, well in advance or even in the last minute. The payment process is extremely simple and we just used an international credit card to checkout without any hassles. So no matter where you are, if you are planning to book train tickets for Europe, just download the Loco2 app and get started! Early bird takes the prize – Well, the prize here is cheaper train tickets! 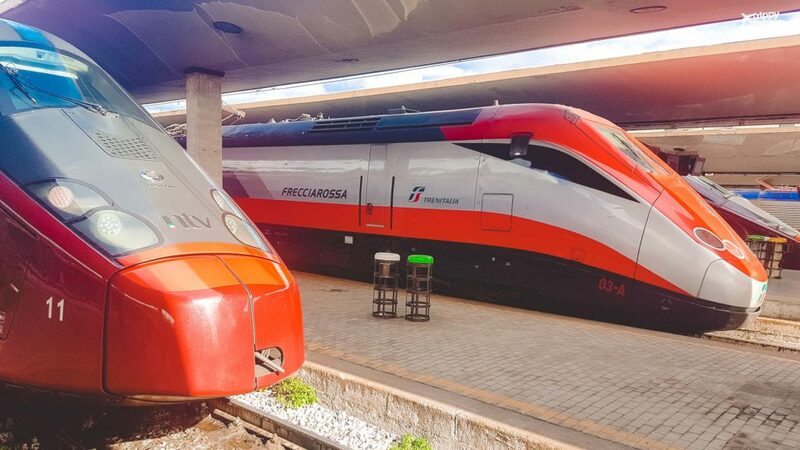 Trains in Italy operate somewhat like how airlines do. The earlier you book your tickets, the cheaper they turn out to be. With Loco2, this becomes even easier! Check ticket prices for various dates and timings easily and compare before making your purchase. Before we delve deep into the day-wise itinerary, here’s a bit about what to expect. Honestly speaking, travel itineraries can be very subjective. Given how vast Italy is, there could be an endless number of itineraries you could explore to plan your trip. 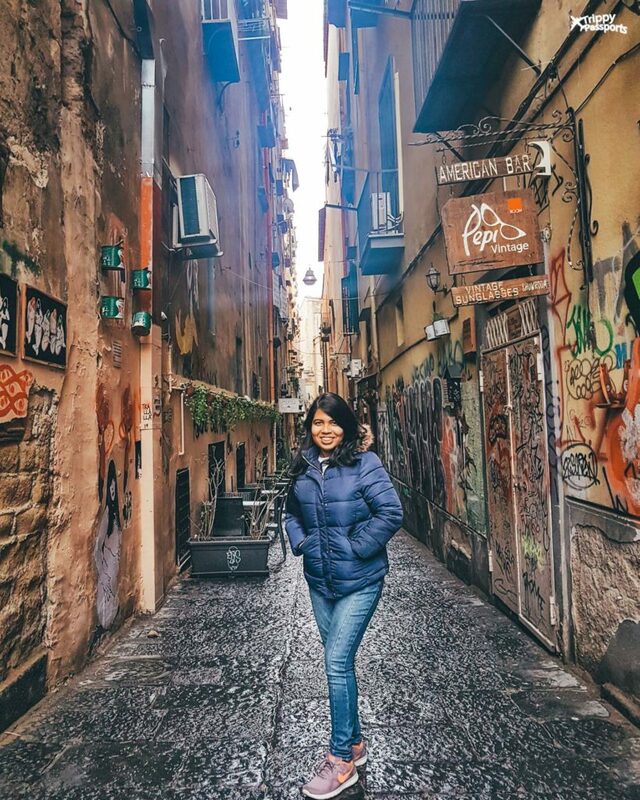 But what we can definitely tell you is that this Italy itinerary for 12 days is not only tried and tested by us very recently, this is also perfect for first-time visitors just like us. When you have this amount of time in hand, have never been to Italy before and want to explore at a comfortable pace, this itinerary should fit right in. It gives you the best chance of seeing the biggest highlights Italy is known for, but without rushing you through the process. A lot of people may tell you to squeeze in more cities within this timeline, but trust us when we tell you it’s not worth it. What’s the point of travelling through a new country if you hop a new city every other day and probably end up forgetting all about it by the end of the trip? 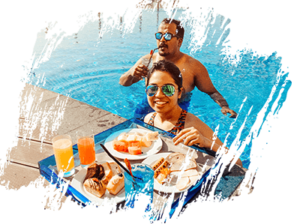 We understand that FOMO (fear of missing out) is very real but we think that memorable experiences in fewer places are any day better than subpar experiences in several places. Moreover, this itinerary focuses on train travel between all the destinations so there’s also travel time between cities to be considered. Keeping all that in mind, let’s get started with our Italian travel itinerary! Typically, most tourists enter Italy through its capital city, Rome. So did we. Let this first day be one of casual exploration, acclimatization with your surroundings and simply soaking in the fact that you’re finally in the land of epic pasta and pizza! Use this day to also prepare for the next two days of sightseeing in the city. 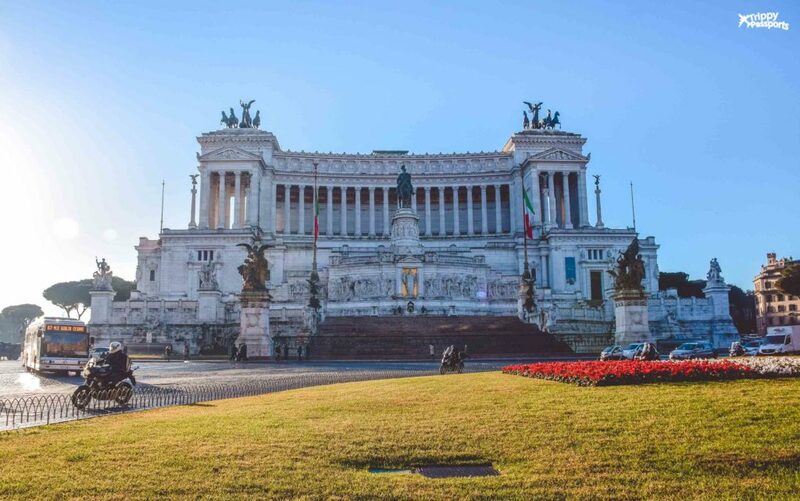 For example, make your reservation for the Borghese Gallery as soon as you land in Rome. The museum only allows visitors with prior reservation via call or email and trust me, you don’t want to miss this one. All you need to do is give them a call and choose a time slot for your visit on a particular day and note down the booking reference number they give you. So get this out of the way on day 1 itself so you are able to visit the gallery the next day. Another thing we recommend you do is purchase the Roma Pass as soon as you get to Rome, either at the central train station or the airport. You can also purchase the pass online in advance and just pick it up once you reach. The Roma Pass gives you unlimited access to all modes of public transportation for 48 or 72 hours and free entry to the first 1 or 2 museums as well as discounted entry tickets to all other listed museums. We bought the 72-hour pass and it was absolutely worth the money! Getting the pass at the start of your trip ensures that you are sorted for the next 2 days. 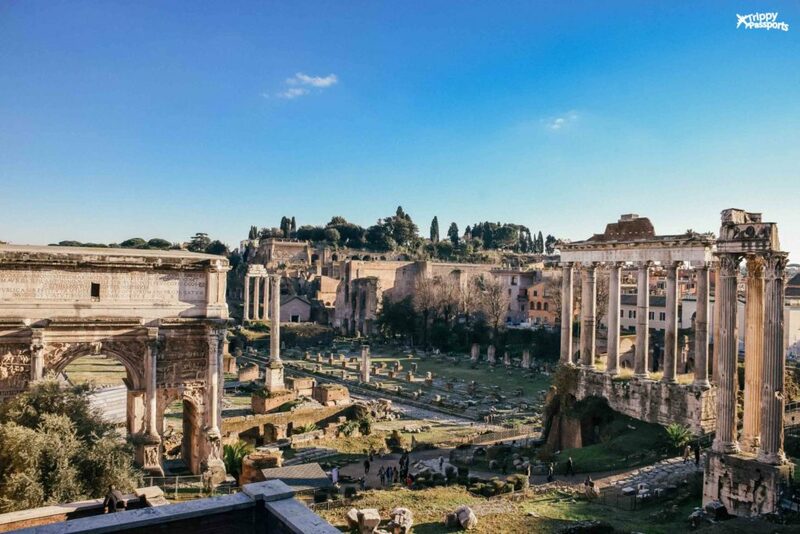 Depending on what time you reach Rome and how much time you have left in the day, you could also plan to visit a couple of sites that don’t require any tickets (so, no waiting time) to start getting a feel of this historic city. 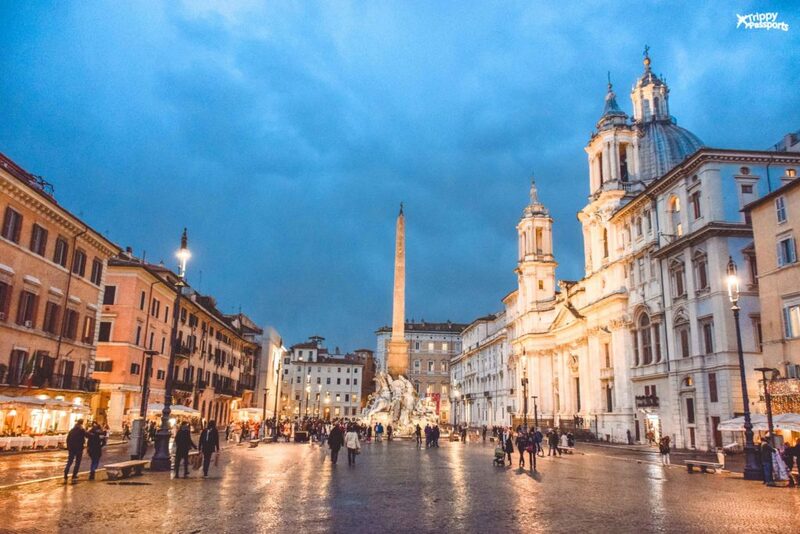 We suggest you explore some of the beautiful piazzas Rome is known for – Piazza Venezia, Piazza Navona or Piazza di Spagna (this is next to the famous Spanish Steps). Spend some time strolling around these large open spaces and admiring the beautiful structures around you! While you are at it, grab a few scoops of the Italian gelato for company. There are tons of gelato stores everywhere near Rome’s tourist spots but these two local gelaterias had our heart – Giolitti and Gelateria Della Palma. 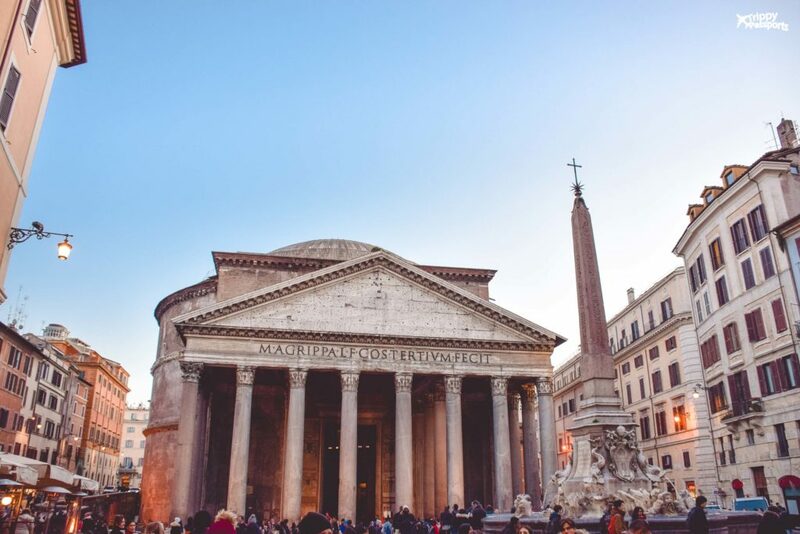 If time permits, follow this up with a visit to the Pantheon. Finally, end your first day with an authentic Italian meal at one of the local restaurants away from the tourist traps. We loved our meal at a restaurant in the historic town centre, called Cantina e Cucina, for their lovely vibe, incredible food and extremely friendly staff! Now that you have settled in, start early on your second day in Rome not only to beat the crowd, but to make the most of your time in the city. 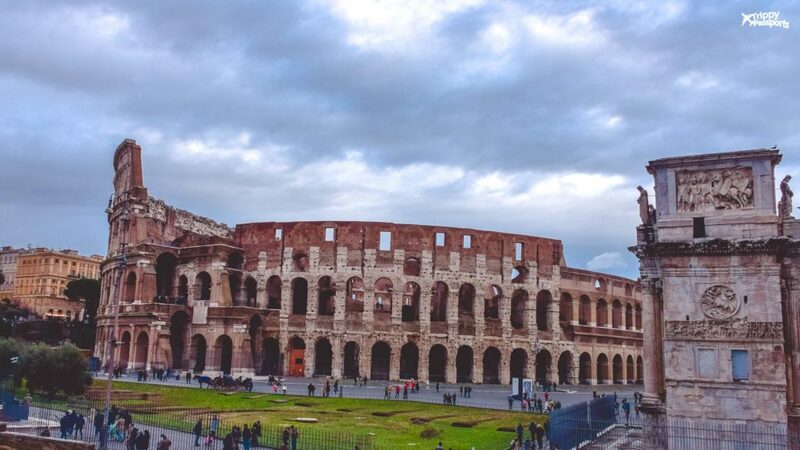 Head to the Colosseum today and get a guided tour of the premises, followed by a tour of the adjacent Roman Forum and the Palatine Hill. 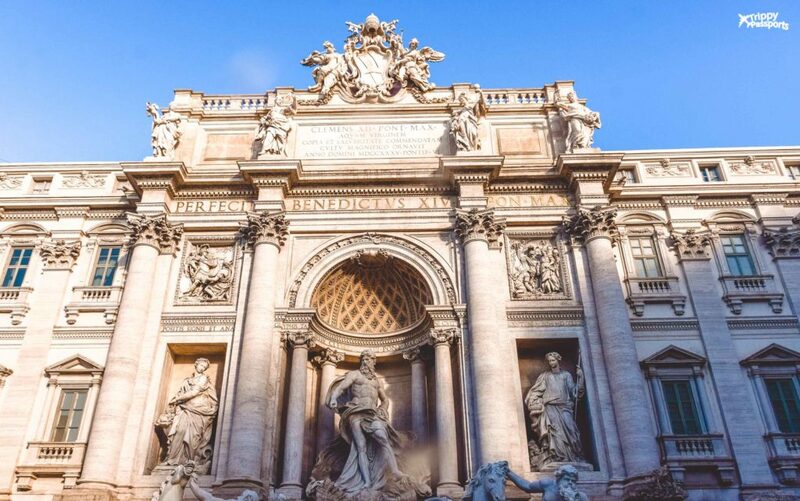 From there, hop on to a bus or tram and visit the Trevi Fountain, one of the largest and most beautiful Baroque fountains in the city. Post lunch, visit the Borghese Gallery and Museum to get sucked into a world of opulent art, rich history and vibrant culture. Spend the rest of the day exploring the cobbled lanes of Romes Jewish Quarters, known as Trastevere. This part of town is best known for some of the best local restaurants and for its vibrant atmosphere. We highly recommend you stick around for dinner at one of the many bustling restaurants. Our favourite here has to be Antico Carlone for their sinfully delicious Spaghetti Carbonara, hands down the best one we had in our entire 12 day Italy trip! 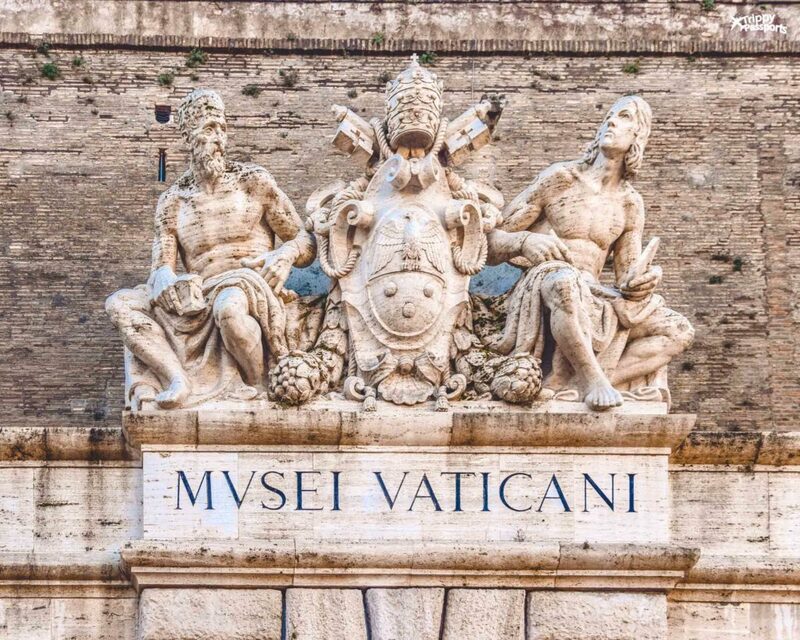 Reserve the first half of your final day in Rome to visit the Vatican City. 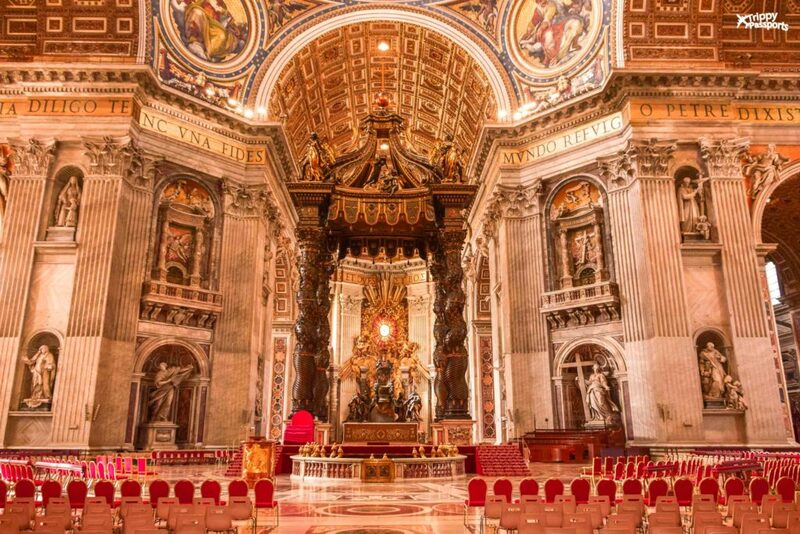 The best way to explore and understand the Vatican is with a guided tour. How else would you know the history behind all that you see in front of you? 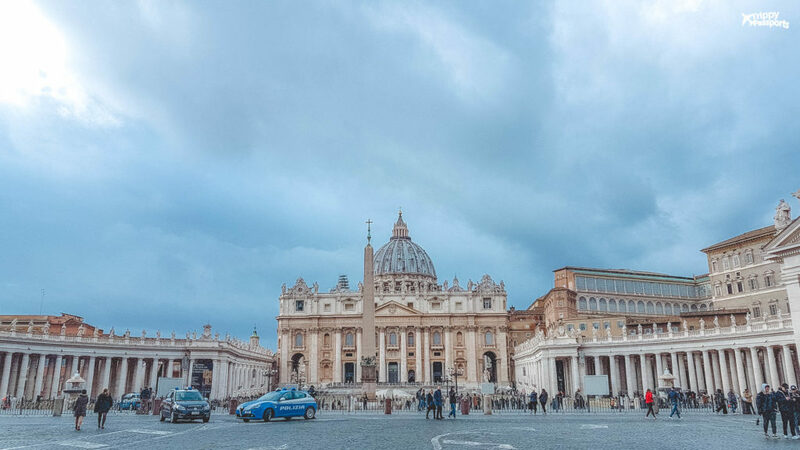 We loved the 4-hour long Complete Vatican Tour we did with Walks of Italy which not only allowed us to skip any queue to enter the Vatican but also helped us gain wonderful insights into the most important aspects of the Vatican City, St. Peter’s Basilica and the Sistine Chapel. Spend the rest of the day without any specific plan, just exploring the beautiful streets of Rome. How about some shopping (or window shopping!) in the Italian capital? Shopping in Rome is also a unique experience where ancient cobbled streets lead you to modern high-end outlets. If you want, take a peek at some of Rome’s famous shopping streets for some serious retail therapy – Via Condotti, Via Del Corso and Via Dei Coronari. On day 4 of your Italian odyssey, get ready to take your first train journey from Rome to Naples, the city that gave birth to pizza! The travel takes a little more than an hour if you take one of the fast trains and can take close to 3 hours with the slower trains. The price also varies and will cost around USD 30 for the former and around USD 20 for the latter. Weigh all your options and book a train that suits you best from Loco2. Once you reach Naples, you’ll notice there’s a stark difference in your surroundings from what you saw in Rome. But we can tell you from experience that it’s not something to fear. We know a lot of travellers avoid visiting Naples for safety issues but we truly believe it’s not something that should prevent you from visiting one of the most culturally rich cities of Italy. The best way to familiarize yourself with Naples is by spending some time just walking around the historic city centre. It is the hub of all activities in Naples and walking around the narrow alleys is an experience in itself! The best safety tip we can offer you is to pay attention to your surroundings and not carry expensive things like cameras or handbags out in the open from where they can be grabbed. Keep your belongings discreet and never carry cash in a place that’s easily accessible, like the pockets of your trousers. 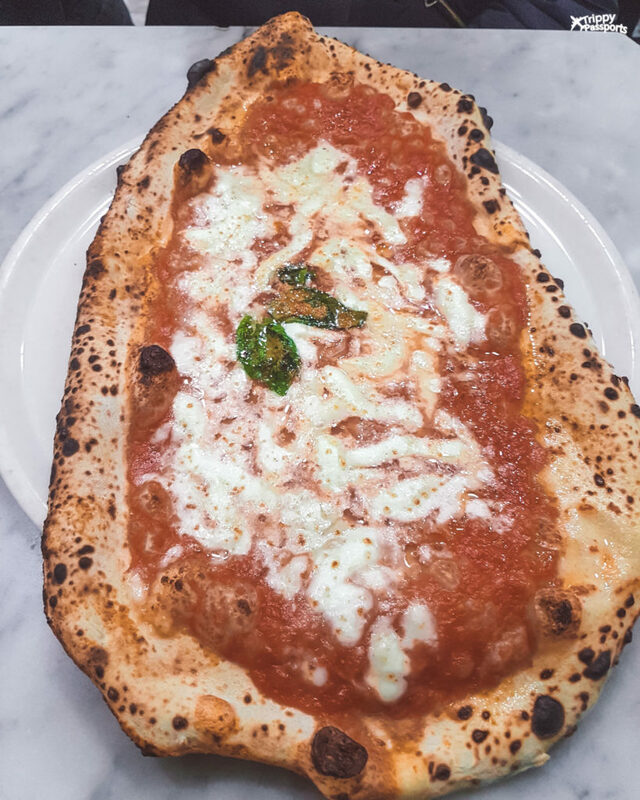 When in Naples, it’s a crime to not have the authentic Neapolitan pizza! If you’ve read or watched Eat, Pray and Love, you may remember the protagonist visiting one of the best pizzerias in Naples – Da Michele. The restaurant is iconic in its own way and we would definitely recommend you to visit them for one of the best pizzas you may have ever tasted! Do keep in mind though that they get hoards of hungry visitors every single day so it’s a good idea to reach before peak lunch or dinner time to grab a table. Today is the day to truly get into the groove and take in the funky vibes of Naples! Start your day with a visit to the Cappella Sansevero to see the stunning sculpture of the Veiled Christ. Photography is prohibited inside hence we have no photos to share from there! From there, plan a visit to Castel Sant’Elmo and take the funicular train up to this medieval castle overlooking Naples. Once the sun starts going down, head over to Piazza Bellini for a glimpse of how young locals chill. Find yourself a spot at the piazza, grab a few cheap beers (Peroni is a local favourite) or the ubiquitous, bright orange coloured Aperol Spritz sold in every cafe and wine shop in small plastic cups for 1 or 2 Euros, and you are sorted for the evening. The madness outside Gino Sorbillo! For dinner, make your way to the famous La Pizzeria Sorbillo, who have somewhat reached God-like status in the pizza community. You’ll know when you see the massive crowd outside the restaurant. Here’s a tip: Make sure to put down your name on the guest reservation list a couple of hours before you may want to have dinner because that’s how long it takes to get a table. But it is SO worth the wait! On your 6th day in Italy, you are still based out of Naples, but it’s time to venture out on a day trip! 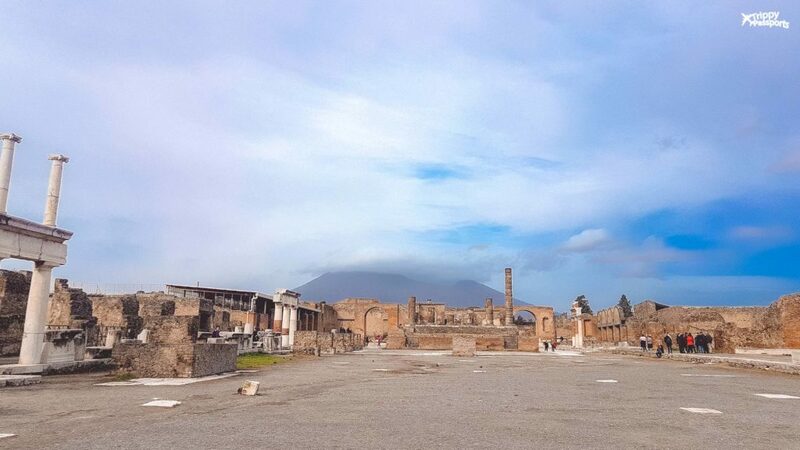 A visit to Pompeii makes for a perfect day trip from Naples because of the ease of travel as well as for its historic value. Hop on the Circumvesuviana train from Naples Central Station that reaches Pompeii in about 30 minutes. This train ticket can be purchased on the day of travel since there are multiple trains running all day at an interval of about 30-40 minutes. We suggest you start a little early to beat the crowd on the train and in Pompeii itself. A self-guided tour of Pompeii can take anywhere between 3 to 5 hours, or even more if you want to explore further. But once you have explored the ruins of Pompeii and had your fill of the imposing Mt. 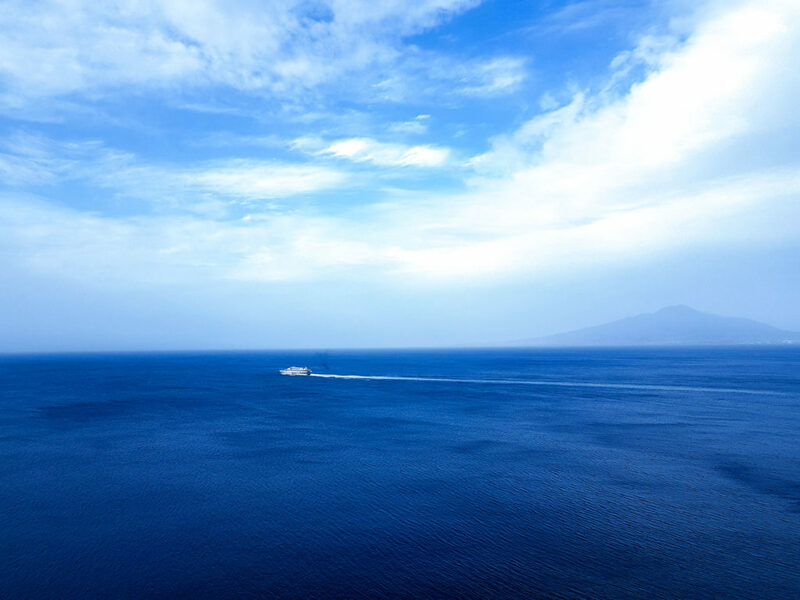 Vesuvius, hop on to the same Circumvesuviana train and go further down to Sorrento. A stunning little town on Italy’s west coast, Sorrento is known for being the gateway to the famous Amalfi Coast and for it’s lemons! The town itself is really pretty and perfect for a day trip from Naples. If you have more days to spare in Italy, you could consider staying here overnight, but for the purpose of our current itinerary, take the train back to Naples at the end of the day. Your next stop on this Italy itinerary for 12 days, is Florence, the hub of all Italian art, history and culture. The best way to get there is to take an early morning train out of Naples to Florence. The train journey takes only 3 hours if you take one of the high-speed trains and costs about USD 35-40 per person on average. You can check out all train journeys between the 2 cities for the date and timing of your choice on Loco2. 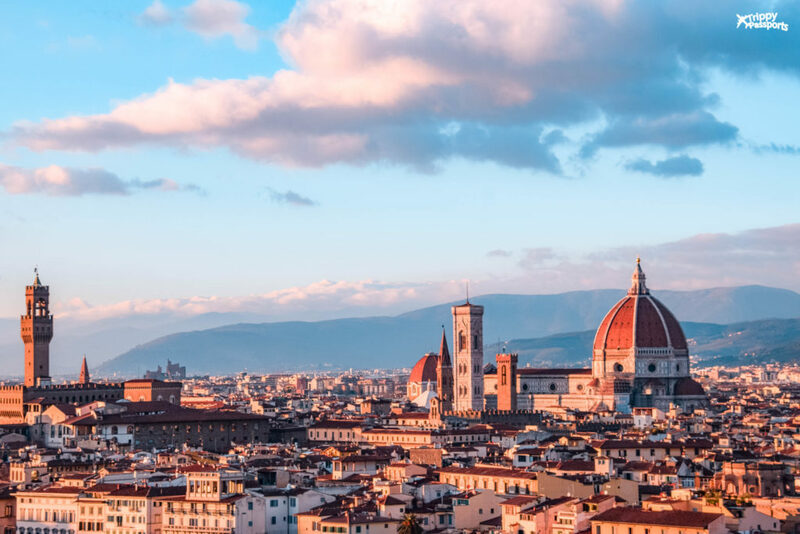 Home to some of the most important and historic art pieces from the Renaissance period, Florence is one city that will leave you wanting more! On your first day, there are a couple of things you should do to prep for the next 2 days. 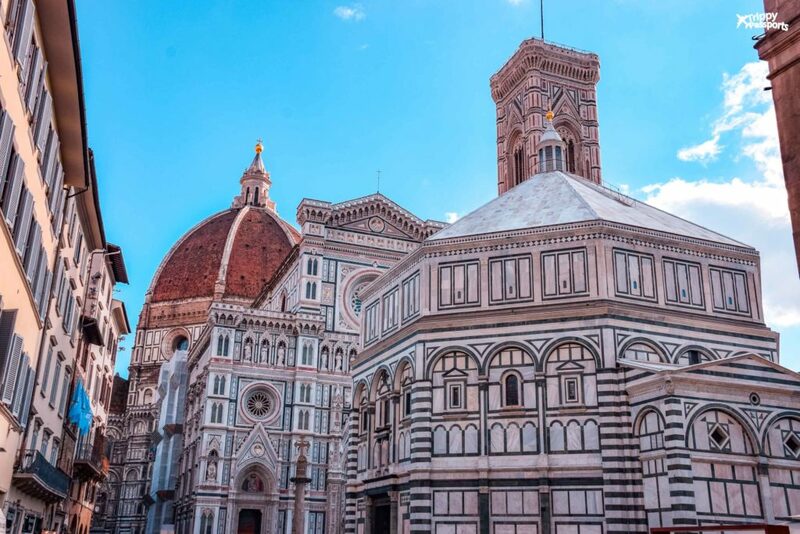 First, head to the Piazza del Duomo to purchase the cumulative ticket that will grant you entry to these monuments for the next 72 hours: Cathedral Museum, Brunelleschi’s Dome (Cupola), Giotto’s Bell Tower, Baptistery of San Giovanni and Archaeological site of Santa Reparata. Entry to the main Cathedral of Santa Maria del Fiore itself is free of cost but you need the ticket to visit all the other surrounding monuments. The reason you should buy this ticket on the first day itself is that it then gives you ample time over the next 72 hours to visit the different monuments at your own pace. Another ticket you should purchase right away is the one for Uffizi Gallery, Palazzo Pitti and Boboli Gardens, valid for 3 consecutive days. Because of their massive demand, it’s not unusual for the museum authorities to run out of tickets. Depending on how much time you have left on this day, it’s a good idea to try and visit at least a couple of the attractions mentioned above, namely, the Cathedral of Santa Maria del Fiore, the Baptistery of San Giovanni, the Cathedral Museum and the Archaeological site of Santa Reparata, which are all very close to each other as you can see in the above image. 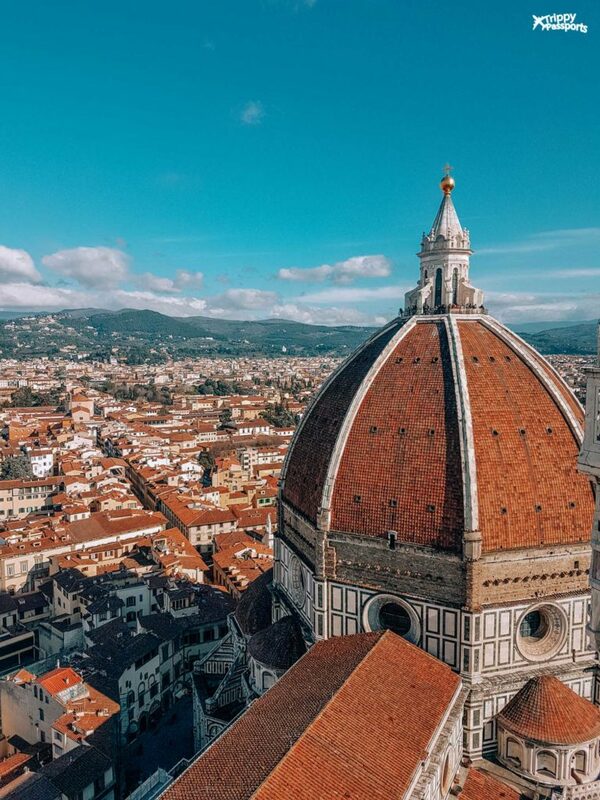 Start your second day in Florence once again at the Piazza del Duomo, but this time to climb 414 steps up to the top of Giotto’s Bell Tower. This, as you can imagine, is quite a task given that the stairs are steep and the passage is narrow. But the view of Florence from the top of the tower is breathtaking and we would do it again if we had a chance! Once that’s done, take a break, catch your breath, and get ready to immerse yourself in some of the most precious sculptures and paintings in the world at the Uffizi Gallery. 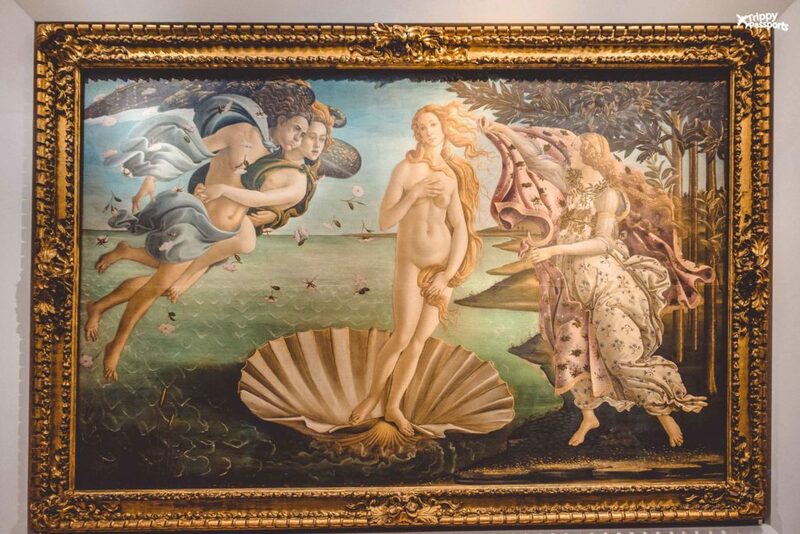 This museum boasts of an unmatched collection of artwork and is most famous for being home to the painting, ‘The Birth of Venus’ by Sandro Botticelli. The museum is massive and a complete tour can easily take up to 2 hours. After this, head to the Pitti Palace and Boboli Gardens which are adjacent to each other. Expect this to take another couple of hours. Wrap up your evening with a meal at a hole-in-the-wall panini shop just behind the Uffizi- All’antico Vinaio, for some of the best sandwiches we had in Florence! 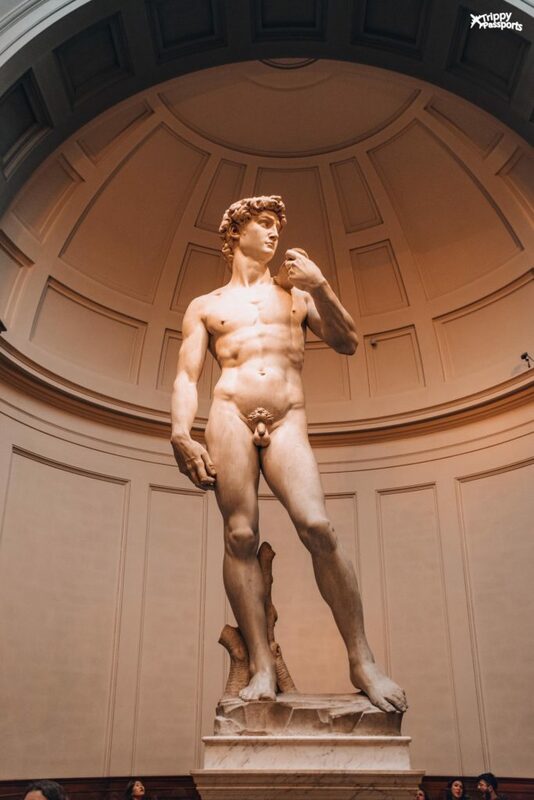 On your final day in Florence, pay a visit to the museum that houses arguably the most famous sculpture in Florence, Michelangelo’s David. The Gallery of the Academy of Florence is one of the most important museums in the city and a visit here is a must on your first trip to Florence. Next on your list of places to visit should be the Basilica of Santa Croce, a beautifully ornate church that houses the tombs of Galileo, Michelangelo and Machiavelli. Today is also a good day to visit any of the places you may have missed out from the previous days since you hold the 72-hour tickets to the Uffizi Museum as well as the Duomo. But no matter what you do, make sure to head to Piazza Michelangelo well before sunset. Located on a hilltop near the Arno River, Piazza Michelangelo overlooks the entire city and makes for a stunning vantage point from a height. And the reason you should reach here just before sunset is so you can watch the transition from daylight to golden hour, finally ending with a beautiful sunset! 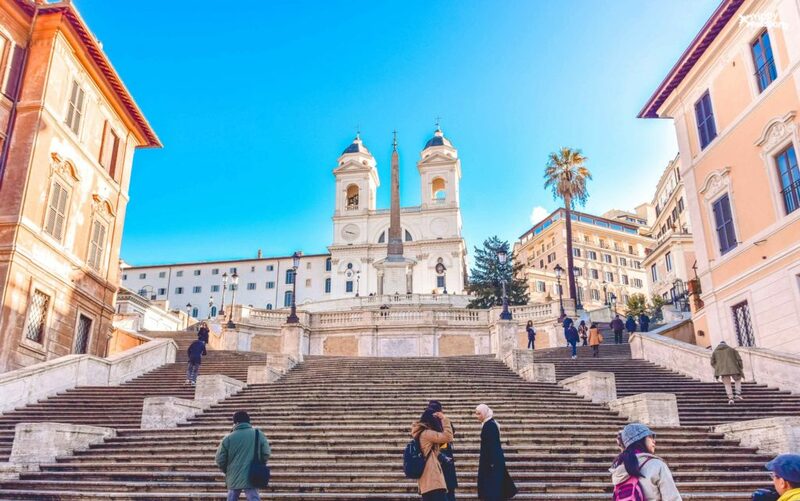 The climb up to the piazza may be a little difficult, but the view is absolutely worth the effort. 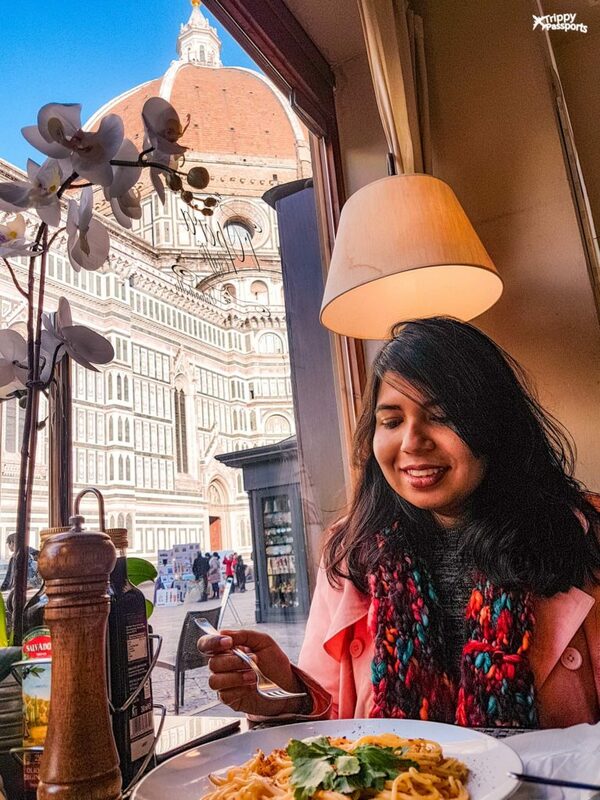 Spend some time taking in the view for a memorable end to your stay in Florence. Now that you’re about to reach the last leg of your 12-day Italy travel itinerary, get ready to hop on the train from Florence straight up north to Milan. The journey takes less than 2 hours on a fast train and costs roughly USD 30 per person. 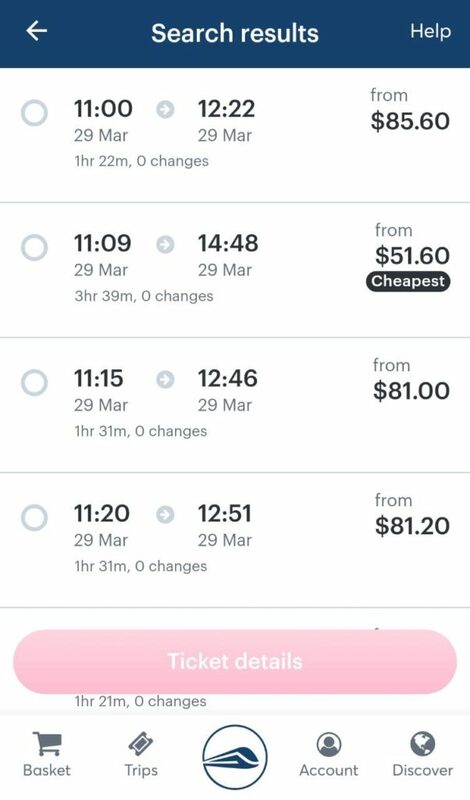 If you don’t mind taking a slower train, you may get tickets for as low as USD 20 for this same journey. Take a look at all the trains for your travel date on Loco2 and choose one that suits you best. 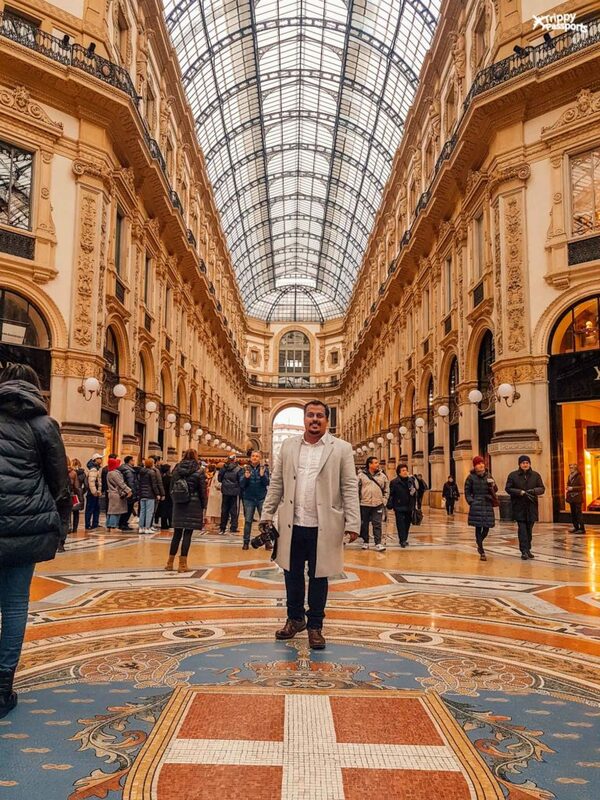 Milan may be known as the home of high-end fashion, but that’s definitely not its only identity. 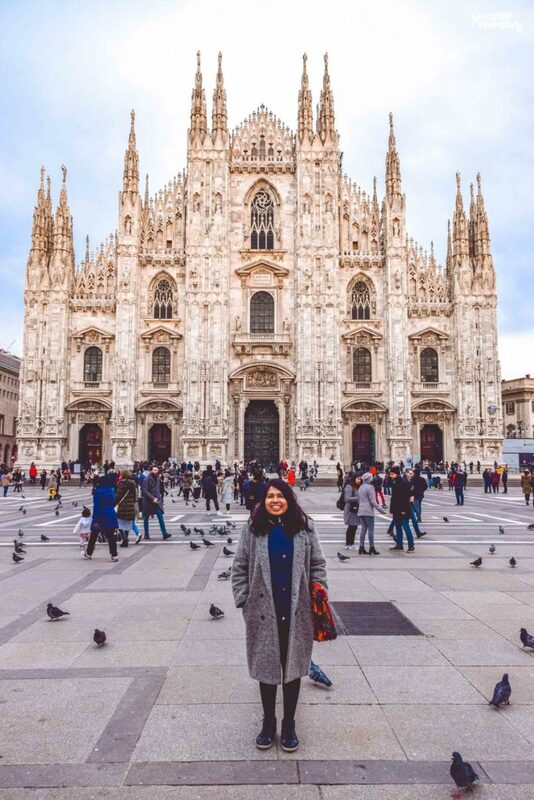 Most travellers tend to avoid Milan thinking there’s not much to do in a city obsessed with fashion, but that couldn’t be further away from the truth. Moreover, Milan is a great hub to take some very interesting day trips out of the city as you will soon see. On your first day here, head to the most iconic building in the city, the Milan Cathedral, also known as the Duomo di Milano. It is the largest church in all of Italy and is a magnificent piece of architecture built in a classic Gothic style. The interiors of the church are decorated with elaborate stained glass panels depicting stories from history while its rooftop is adorned with hundreds of delicately carved spires. Purchase the Duomo Pass that will give you access to not just the cathedral, but also these places: Crypt of St. Charles, Duomo Museum, Church of San Gottardo and the cathedral’s stunning rooftop (either by lift or stairs). 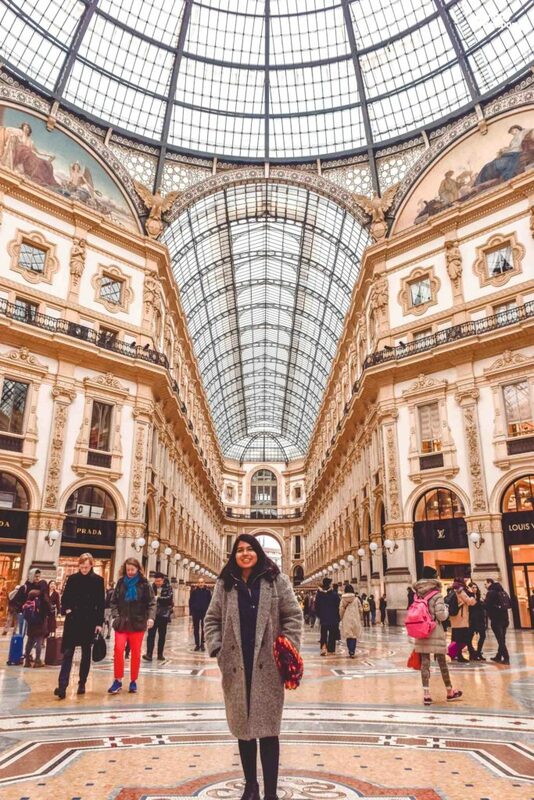 All of this will easily take up 4-6 hours, so follow this up with a stroll at Milan’s oldest shopping complex – the Galleria Vittorio Emanuele II. If there’s one structure that brings together Milan’s love for fashion and its architecture, it is this! Milan is extremely well connected with different modes of public transportation, so make sure you also purchase a 48-hour ticket on your first day here. Priced at Euro 8.25, this will give you unlimited access to all public transport for the next 2 days of your stay. This ticket can be easily bought at newspaper or tobacco stores across the city. 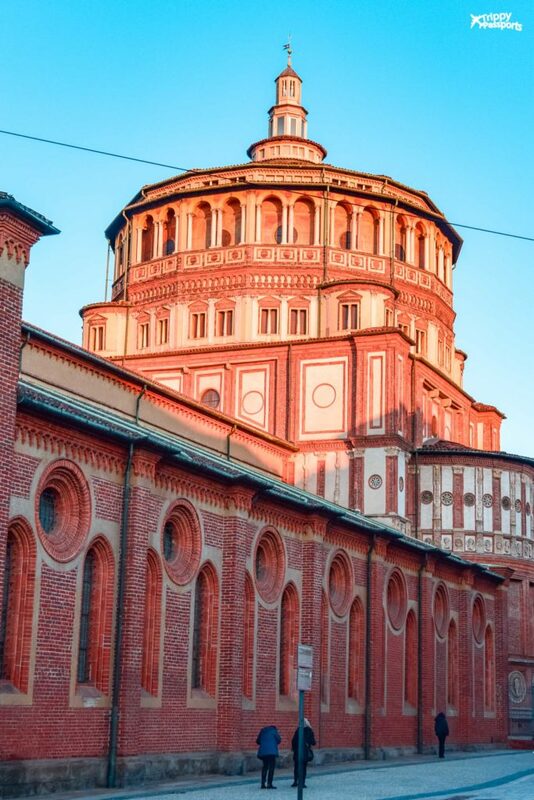 The Church of Santa Maria delle Grazie in Milan is where the famous artwork by Leonardo Da Vinci, The Last Supper, is located. Start your day here, followed by a visit to the massive Castello Sforzesco. The huge castle complex has museums and gardens and the sheer size of it is something to admire. Once you are done here, it’s time for a break! Walk a little bit and find yourself at one of the only 5 Starbucks Reserve coffee shops in the world, right in the heart of Milan! You might be wondering why you should be wasting your time visiting a coffee shop that’s everywhere. But the Starbucks Reserve in Milan is not just any Starbucks outlet. It’s almost like a coffee museum, factory, roastery and a cafe all put together in one place, resulting in the most fascinating cafe experience you can have! 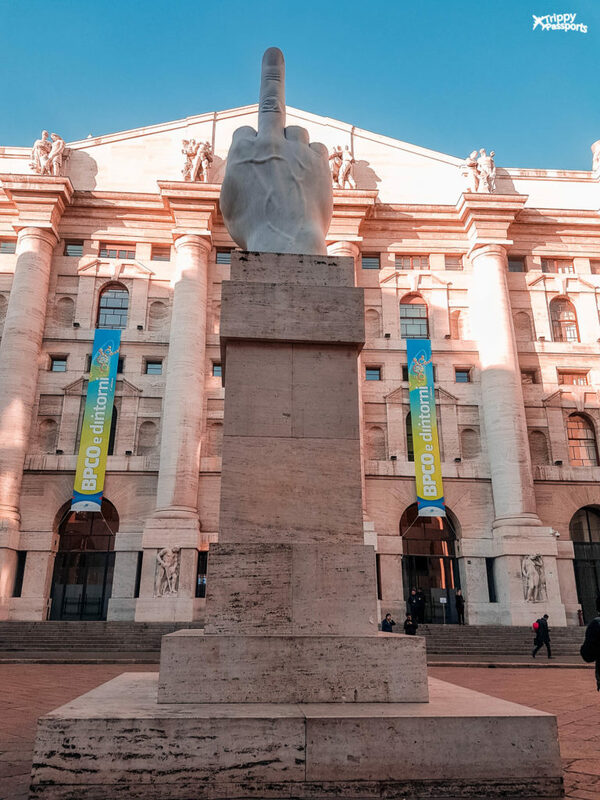 From there, walk over to the nearby Italian Stock Exchange building to see this really interesting (provocative for some) piece of art created by artist Maurizio Cattelan, which depicts a hand showing the middle finger to the financial hub of the country. Its interpretation remains ambiguous but come here purely for its creativity, artistic value and fun quotient! Apart from fashion, if there’s one more thing the Milanese love, it is the culture of Aperitivo, which refers to pre-dinner drinks and snacks, something to prep you for dinnertime. 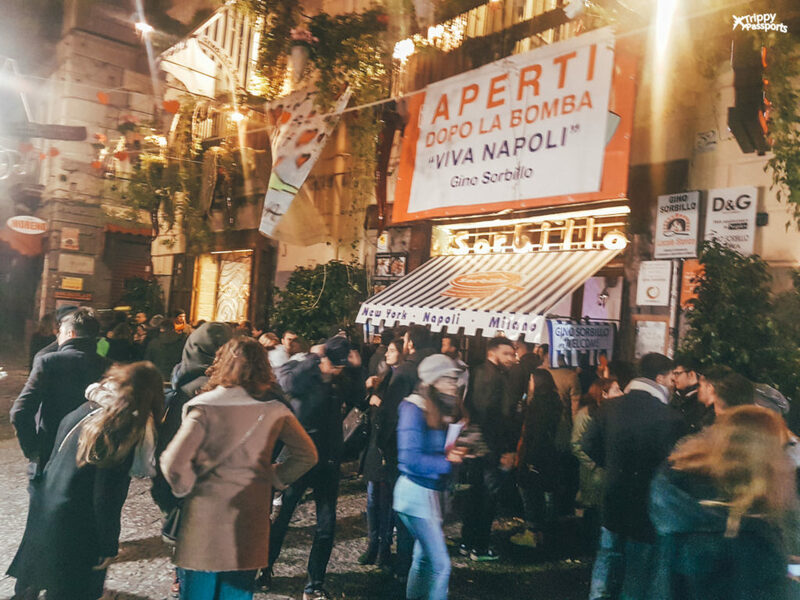 Aperitivo is a big deal in Milan and you’ll typically find restaurants advertizing deals offering drinks and snacks. It’s also a great way to socialize in Milan and restaurants are buzzing with the crowd enjoying their cocktails or wine and nibbling on cheeses and meats. 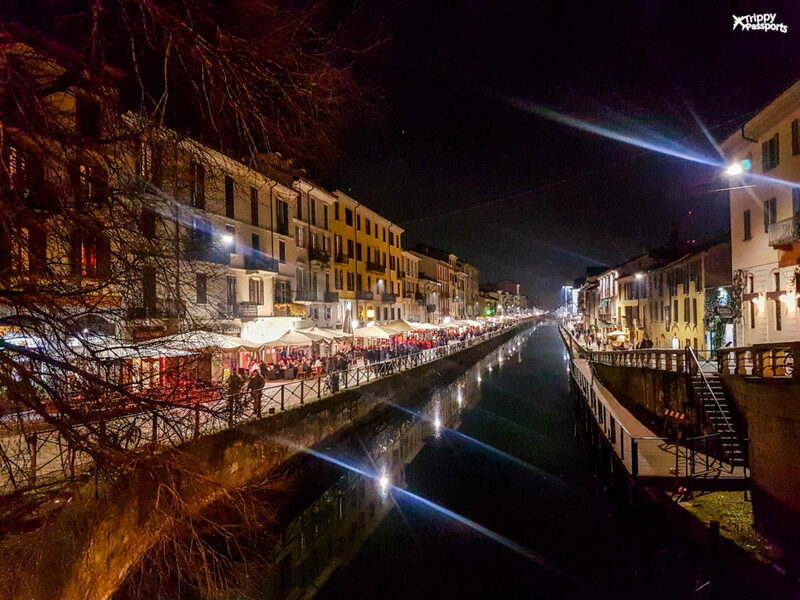 To enjoy a Milanese-style Aperitivo, head to the Navigli district in the evening. Flanked by two massive canals, a slew of bars and restaurants have cropped up here, especially known for serving great Aperitivo! Pick a bar that piques your interest and get ready for a gala time! 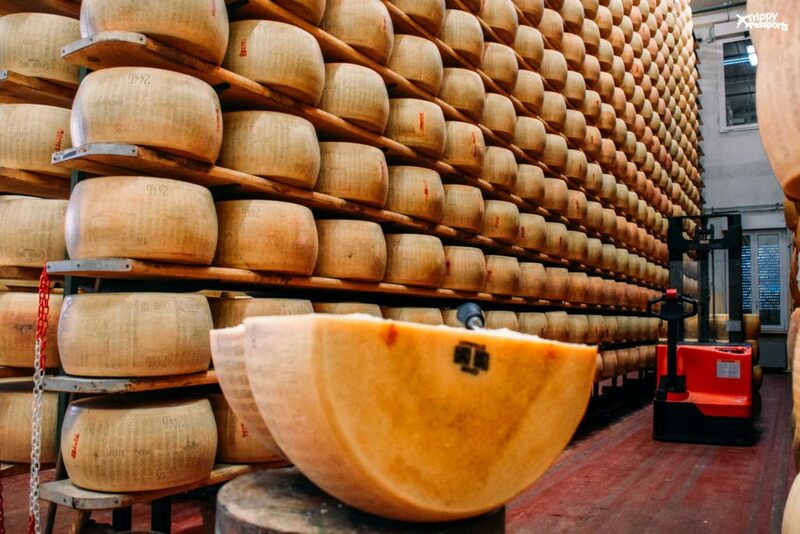 One the last day of your trip, it’s time to head out of Milan for a day trip to the town of Parma, the birthplace of one of the most famous Italian cheeses – Parmigiano Reggiano. Parma is about 1-1.5 hours away from Milan on a direct train and the tickets cost about USD 12-20 per person. You can find all the possible options on Loco2. 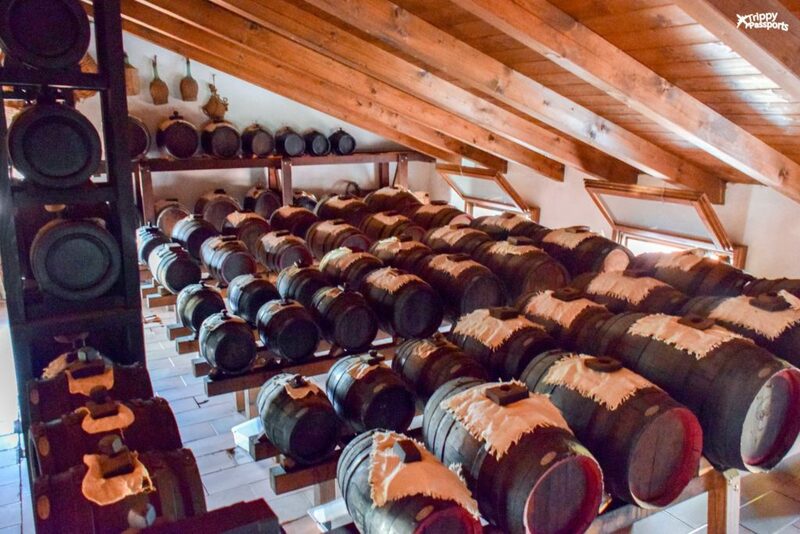 In Parma, we highly recommend a full-day guided tour on the aptly-named TastyBus that takes you around the Parma region to local production facilities of Parmesan cheese, Parma ham and Balsamic Vinegar. You may be wondering what’s the big deal about these products when they’re available all over the world. You’ll be surprised to know that only the cheese, ham and vinegar produced in this region following certain strict guidelines are allowed to be labelled and sold as the authentic Parmesan cheese, Parma ham and Balsamic respectively. 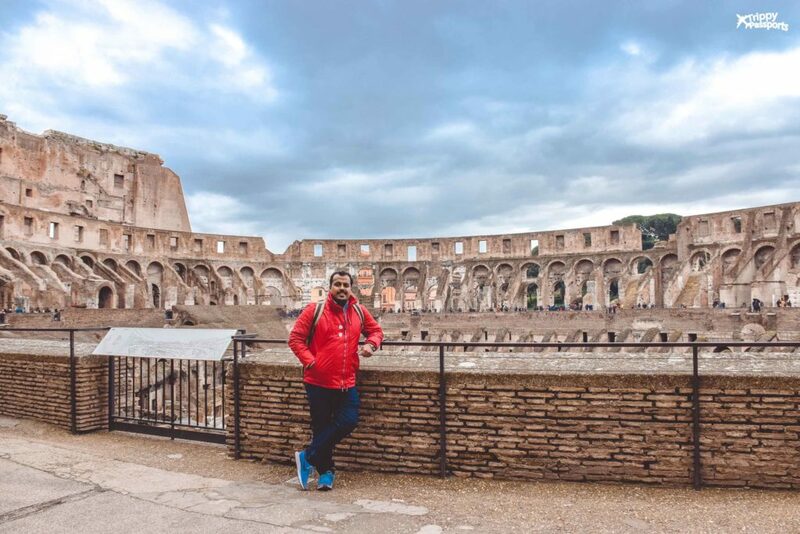 Our TastyBus tour with a knowledgable local guide was a wonderful way to get a glimpse of Italy’s love for food and explore firsthand where some of the food on our Italy trip came from. As a bonus, you also get to taste some all of these products straight from the factory on this tour. So if there is one food tour you do in Italy, make it this! That brings us to the end of this whirlwind journey through Italy in 12 days! Nothing short of a sensory roller coaster, we have to admit. And in the best way possible! If you are looking for a European destination to visit for a long break, are a foodie and enjoy a bit of history, art and gorgeous views, Italy is going to be perfect for you! We hope you are able to enjoy this guide to your first Italy trip as much as we enjoyed ours. Have questions or need more information? Feel free to drop a comment! Fantastic read! Certainly need to put it on my bucket list!